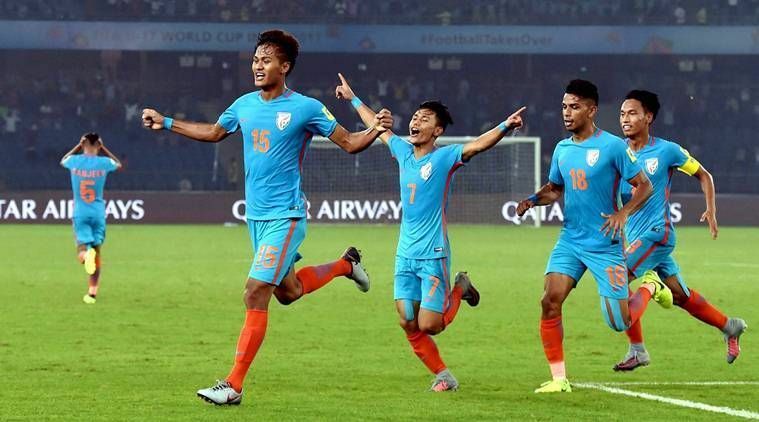 The 2017 FIFA Under-17 World Cup held in India was a momentous one for the country not only because of the significance of the event, but also because it presented football fans in India a glimpse of their budding footballers in the junior age groups. The tournament, the first time India played host to a FIFA event, saw an overall attendance of 1,347,133 throng the stadiums to witness the event with the Indian Colts getting plenty of support despite being matched up against superior opponents. India's U17 side participated in the U17 World Cup for the first time in last year's edition by virtue of being the hosts. Despite finishing their campaign winless, the experience gained by playing against the top sides in the world will no doubt be a shot in the arm for the youngsters. India's U17 side has been in place for over 30 years now. The very first international game for the team was back on August 20, 1984 in Bangkok, a 2-1 loss to China. Their biggest win also came in Bangkok, just a few days in fact after the loss to China, when they beat Macau 13-0 on 29 August, 1984. The team is currently coached by Luis Norton de Matos, a former Portugal international. He was appointed head coach in March last year, just a few months before the U17 World Cup. He also heads the country's Under-19 side as well as the AIFF’s developmental side, the Indian Arrows, in the I-League. A lot of the youngsters that were a part of this team play for the Arrows in the I-League where they have the opportunity to go up against seasoned pros. In the U17 World Cup last year, the Indian Colts were grouped with Ghana, Colombia and the United States. It was always going to be a tough ask and it proved to be exactly that as the team lost all three games, conceding nine goals and scoring just once. That distinction fell to Jeakson Singh, who etched his name in the history books when he became the first ever goalscorer in a FIFA World Cup for India with his header in the 2-1 loss to Colombia in the Colts’ second game. His goal sent the fans into a tizzy, but sadly it wasn't enough as Colombia would score the winner soon afterwards. Minerva Punjab, the newly crowned I-League champions, have honed a fair few of these players, including Jeakson Singh. It was an approach that paid off for them as their youth-centric approach with the use of players from the national U17 side as well as their own academy powering them to glory ahead of some of the more established names of Indian football. Nangdamba Naorem, Mohammed Shahjahan and Anwar Ali were the others signed by Minerva before being loaned out to the Indian Arrows. This group had been an integral part of Minerva Punjab's run to the U16 I-League title last season. Naorem was one of the youngsters who caught the eye in this year's I-League. He scored perhaps the goal of the season against Shillong Lajong with his solo effort. Other notable names have been Amarjit Singh Kiyam, who captained the Arrows and the centre-back pairing of Jitendra Singh and Anwar Ali who performed very well for the Arrows. Ali, in fact, was one of the standout players for the national side at the U17 World Cup last year. Composed while defending with the ability to pick out a pass from the back, he was a solid mainstay at the back for de Matos as India looked to contain sides physically and technically more adept than them. It was no surprise to see him continue his excellent showings in the I-League. Abhijit Sarkar was the top scorer for the Arrows this season with four goals. Aniket Jadhav was another from the bunch who scored twice and looked good. Goalkeeper Dheeraj Singh Moirangthem left for Europe midway through the season after six appearances. He is currently on trial with Scottish side Motherwell FC. Many of these players took home Man of the Match awards during the course of the season led by the two goalkeepers Dheeraj Singh (2) and Prabhsukhan Singh Gill (3). Aniket Jadhav, Jitendra Singh, Abhijit Sarkar, Anwar Ali and Edmund Lalrindika all won it once. The World Cup aside the U17 side has competed in continental competition. In the AFC Championship, India have competed seven times, but have never progressed past the group stages including in the 2016 edition which was held in India. The SAFF Championship though has been a tournament where the team has enjoyed some success, much like the senior side. In four appearances, they have won it twice and finished runners-up the other two occasions. They've faced Nepal in three of those finals, winning twice (2013 and 2017) and losing one (2011). The other final was against Bangladesh in 2015 where they ended up losing on penalties. I-League 2018-19: From Luis Norton de Matos to Floyd Pinto, is the Indian Arrows project also heading the Pailan Arrows way? Uniquely Indian, yet a mascot for the world!